The Ozo was seen as a very popular camera, perhaps the flagship of the new push into 360 shooting. A stop on further development comes as something of a surprise, given the continuing interest from other vendors. Samsung, for instance, has introduced the 360 Round, a 17 lens camera (eight pairs plus one looking up), in a 205mm diameter case. It also includes six microphones for surround sound. Price is predicted to be $10.500 (the online Nokia store still offers the Ozo at 23,500 euros or more than two and a half times the price). IBC saw plenty of VR demonstrations. So is it happening or not? I am sure I have written in these pages before about the Gartner hype cycle, the plot of technological development which new concepts go through, as proposed by the market analysis giant. The spark of innovation leads in a rapid rise to a peak of inflated expectations, which is equally rapidly followed by the trough of disillusionment as reality proves to be much less exciting than promise. A cooler, more detached look at the prospects may lead to a slope of enlightenment oh, thats what its for and a plateau of productivity. What all new ideas have is the initial meteoric rise and equally rapid plummet to the trough of disillusionment. How far the slope of enlightenment rises is the critical part of the process: is this idea going to be a winner or not? My view without the might of Gartner behind the theory is that for a new idea to take off there needs to be three things in place. There needs an enabler: it must be technically possible. It needs a driver: people must want it (or be convinced they want it). And there must be a business case: someone, somewhere, is going to have to pay for it. If we cast our minds back just a few short years, we will remember that if a stand at IBC or NAB did not give you a pair of glasses to look at their presentations, then you just walked on by. 3D was the next big thing. Except that it did not work out that way. The peak of inflated expectations was huge, but it never really recovered from the trough of disillusionment. In my mind, that was because there was an enabler 3D television could be done but no driver. Consumers did not want it, because they did not want to black out their living rooms and watch television wearing dorky glasses. The business case was skewed too. Consumer electronics manufacturers loved the idea because it could push television set prices back up while costing little more than an extra $5 chip and a free pair of glasses (extra pairs at a substantial after-market price). But for broadcasters it was a big investment for very little, if any, return. VR means watching television wearing seriously dorky glasses, or possibly wearing a piece of folded cardboard which balances your phone on your nose. So you might be forgiven for thinking that resistance would be similar. I think the challenge for VR is more complicated. I have been involved in the IBC Awards for some years now. 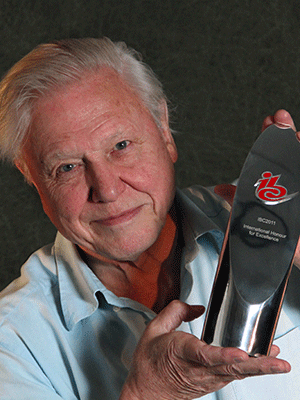 Back in 2011 I decided that the IBC International Honour for Excellence, the lifetime achievement prize, should go to Sir David Attenborough, and I persuaded the relevant people that this was a good idea. I then got to meet him, and yes he is every bit as charming as you hope he would be. 3D television was a hot topic at the time, and he had just made a programme called Flying Monsters for Sky. We chatted about 3D, and what might come next, like VR or holographic imagery. He said something that was a blinding flash of the obvious, which I have treasured as a talisman ever since. Yes, he said, talking of holography, you could get a tiger to jump out of the television set and stand on your coffee table. But then what do you do? How do you tell a story with it? That, for me, is the problem with VR. The technology is clever, but how do you tell a story with it? How can you construct a narrative whether it is a drama or a natural history documentary if you do not know where your audience is looking? Over 120 years, directors have developed a language for movies and television, which uses lighting, and focus, and performances to draw the viewers eye without them realising they are being manipulated into seeing the critical action, the gestures and reactions which tell the story. How does that work if the viewer might literally have their back to it? BT Sport won an IBC Innovation Award this year for its coverage of the UEFA Champions League Final. Included in that was a multi-camera VR shoot, with its own dedicated graphics and commentary. But the story of a football match is pretty simple: you follow the ball. Wearing VR goggles you move your head to follow the ball, rather than letting the director and cameras do it for you. It is hard to see other mainstream applications for the technology. This years television hits have been tense dramas like Liar and Doctor Foster. How would the ability to look around the locations make them even more gripping? Without wishing to suggest this magazine turns its readers to drink, if you have a newish Apple phone then you might like to check out the Patrn Experience, a new app from top tequila maker Patrn. You can experience in your own home, in VR, the complete process from growing agave plants to tasting notes from a virtual bartender. American mass market retailer Walmart is looking to use VR in its online store. If you fancy buying a tent, VR could take you to a campsite, let you virtually experience putting it up and seeing how much space you have. Hotels and airlines have long used VR to let you look around a room before you book, or tempt you to upgrade to a premium seat with flat bed and cocktails on demand. And of course there is gaming, where users actively want an immersive experience they can live in. The latest release of Windows 10 powers VR headsets direct from a standard PC. Sony claims to have sold more than a million Playstation headsets at $399. Conveniently, as I was scratching my head and wondering how to finish this article, an email pinged into my inbox advertising the Virtual Reality Creative Summit 2017, in London in December. Among those promised to appear at the summit are BBC and Discovery Channel; Google and Microsoft; Saatchi & Saatchi and Vice. Clearly there are a lot more creative and insightful people than me looking at the subject. But I remain unconvinced that, for us traditional broadcast and media people, VR has the power to change the way we tell stories. Nokias decision suggests we are on the downslope to the trough of disillusionment. How far will we bounce back?